As I mentioned in my last post, my reflections on why astrology appears to work eventually came to be illuminated by my researches into the art of storytelling. I got as far as describing briefly the ancient approach to the “allegorical” reading of poetry—that is, seeing more meanings in a text than the surface, literal meaning. By the time of Augustine, only the Bible was thought to be able to support such a deep type of reading, but Dante opened the door to reading other works—his own in particular—in this way. Gradually it came to be acknowledged that any literary work could be read or interpreted in a number of ways. A few years ago I became excited by the idea that this way of reading, the allegorical, can be applied to any story, sacred or profane, complex or simple, written or verbal. As I recall, it was the very day that I had this thought that I tried to apply it to a simple story that I found online. I know that I’ve written about it before, but now I can’t find it in my old blog or anywhere else, so I’ll recap the analysis from memory. I read a blog post by a woman in the U.K. who described as simple recent event in her life. She went into her bathroom and saw a wasp in the toilet, struggling to get out of the water. She felt a pang of compassion for the wasp and wanted to help it, but at the same time she was afraid that if she freed the wasp that it might sting her newborn baby. So she wound up flushing the wasp down the toilet, but felt a pang of remorse for doing so, and indeed it was this pang that led her to write the blog post. I looked at this simple, real-life story through the lens of the ancient four-level allegorical approach. What are the meanings of this story? I will try to recall my analysis. The first level is the literal level. At the literal level, everything is just as it appears to be. This would be the level described by science: a woman enters her bathroom, finds a wasp, considers what to do, and flushes it down the toilet. The meaning of each of these words corresponds to its dictionary definition, pure and simple. The woman is an adult female Homo sapiens; the bathroom is a room in the house containing fixtures for bathing and excreting; and so on. The woman will be of a certain age, a certain height, a certain weight, and so on; the toilet will be made of certain materials and be of a certain color; and so on for all the other things mentioned in the story. So much for the literal level. How about the moral level, the second of what I’ll call the four Alexandrian levels (for I believe that this system of reading must have come from the grammarians of the ancient library of Alexandria)? Here I saw the story as being charged with certain values. The problem the woman faces is actually a moral one: whether to help a wasp that is struggling for its life, or whether, out of fear of what that wasp might do, to end that life. In this story, fear trumps compassion, and she chooses to kill the wasp, even as she feels guilt for doing so. A summary of the moral level of the story might be something like, “A woman, finding a potentially dangerous animal in distress, feels compassion and wants to help the animal, but feels fear as well for her own baby, and decides to kill the animal in order to stay safe.” Here I’m not trying to draw a “moral” from the story; I’m just trying to summarize it in moral language. The moral level has to do with the emotions and values that drive the action. While the woman’s behavior here could be looked at psychologically, it falls outside the realm of the hard sciences—physics and chemistry—that are the realm of the literal level. As a moral tale, it’s about a woman grappling with an ethical question, coming to an answer, and then having feelings and reflections about it. Next: the allegorical level, properly so called (for all readings other than the literal, as Dante noted, can be called “allegorical” in the sense that they refer to meanings brought in from outside the literal text). Here my thought was to look at the story as a system of symbols. For while science can note that the protagonist of this story is a woman, an adult female Homo sapiens, in our experience the word woman has meanings that go far beyond those categorical labels. Every one of us took form in the womb of a woman and took birth from a woman’s body. In mythology woman has appeared as goddesses and heroines of vastly many types, including personifications of the Earth and the cosmos. From ancient times woman has had a special connection with compassion: in the ancient world the goddess Isis was the goddess who wept, first for her dead husband Osiris, and then out of compassion for her devotees, whose pain she understood and felt. Here we’re going beyond what the dictionary tells us about woman. We’re exploring the associations and connotations connected with the term; we’re looking at it not as an isolated thing, but at how it is interconnected with other things in the world; we’re looking at its subtleties, at its significance, in the usually understood sense of that word. This is not like the literal level; physics and chemistry can’t tell us anything about this level. In this story, if we look at the wasp in more detail, we find some interesting things. A wasp that can sting us is a female wasp; her stinger is the wasp’s ovipositor, the organ through which she lays her eggs. In my research into figs—an image in my own writing—I discovered that wasps have an intimate relationship with fig-trees, and act as fertilizing agents for figs, even as the fig from ancient times was itself seen as a symbol of fertility, because of the great number of seeds in its fruit. And according to Wikipedia, wasps reproduce mainly parasitically, by depositing their eggs in the bodies of other insects and spiders. When the young hatch, they devour their host from within—a horrible death. Putting even these preliminary thoughts together, we start to find meanings in our story. 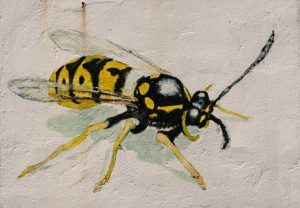 For the protagonist of our story is a mother, and her antagonist, the wasp, is likely a mother too, or anyway a certain kind of symbol of motherhood. The encounter has aroused the protective maternal instinct in our human mother; she sees in this nonhuman insect-mother a threat to her own child. Now the woman has found the wasp drowning: the wasp, no doubt trying to take a drink, has fallen into the water, which is not its element. The wasp, a winged insect, is a creature of the air, and in trying to preserve its own life by taking on water is now in danger of dying from it. Water is itself a powerful and widespread symbol: it is associated with the unconscious and the emotions, and, rising and falling in the monthly cycle of tides, with womanhood as well. The wasp is a type of mother that kills in order to foster its own young. In a certain symbolic sense, when the woman sees the wasp in the toilet, she is seeing a dark aspect of her own motherhood, as in a mirror (reflectiveness being another famous property of water—as witness the story of Narcissus). Should she help that aspect to survive, or not? She decides not, and herself kills in order that her own young may be safe. She does this by flushing the toilet, for that is where this little drama has taken place. But what is a toilet? It’s the appliance by which we get rid of our excrement—the waste products of our bodies, matter that has been purged of everything useful and helpful to us, and which has in the process become loathsome to us. In being flushed down the toilet, the wasp is equated with excrement. She is being sent to the place of oblivion and nonbeing to which we send our bodily waste: out of sight, out of mind, to unconsciousness. I think this story is one in which a woman is presented with the dark aspect of motherhood, its deadly side, and with a shudder she flushes it from awareness. But it lives on as a disturbing feeling, a feeling of guilt. Or anyway, that is one way of reading this story symbolically, or, as I’m calling it here, allegorically. The fourth and final level is known as the anagogic level. We could call it the spiritual or mystical level. I think of this level as the one that addresses the issue of our journey to salvation. At each level of the story we arrive at a more difficult task of interpretation. Interpretation at the anagogic or mystical level will depend on one’s spiritual maturity and orientation. If you believe in a particular religion, then you will be obliged to interpret in its terms, as Dante did in his letter to Can Grande. If you do not, then you must fall back on whatever spiritual training or intuition you may have—whatever mythology speaks to and from your heart. So there is a quick look at the four levels of meaning in a story according to the Alexandrian method of interpretation. As for how this ties in to the effectiveness of astrology—bear with me. For the journey itself is interesting, is it not? This entry was posted in astrology, thoughts and tagged allegory, astrology, how astrology works, levels of meaning, storytelling. Bookmark the permalink. Glad to hear it, Phyllis. Thanks for taking the time to comment.